Bugatti have been featured on the Gentleman’s Journal website as one of the best coffee machines on the market. This machine can use both fresh packed grounds and coffee pods and has the capability to pull two shots at a time. 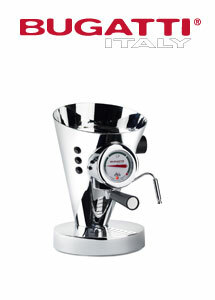 The Diva has been designed with a steam wand for frothing milk making an endless choice of options. You will have no difficulty finding a place for this machine in your kitchen.